ION Orchard kicks off its 10th anniversary celebrations with a splash this Spring/Summer fashion season with the first live mermaid tank installation along Orchard Road, as well as, have the chance to partake in a slew of fun and engaging activities and events, and exclusive deals and surprises in conjunction with the mall’s special milestone. From 1 to 28 April, every Friday, Saturday, and Sunday at 5pm, 6pm, and 7pm, the mall’s outdoor space ION2 transforms into a dreamlike fashion garden, complete with an aquarium that will feature meet-and-greet sessions with an underwater mermaid dressed in a glittery sequined mermaid tail. 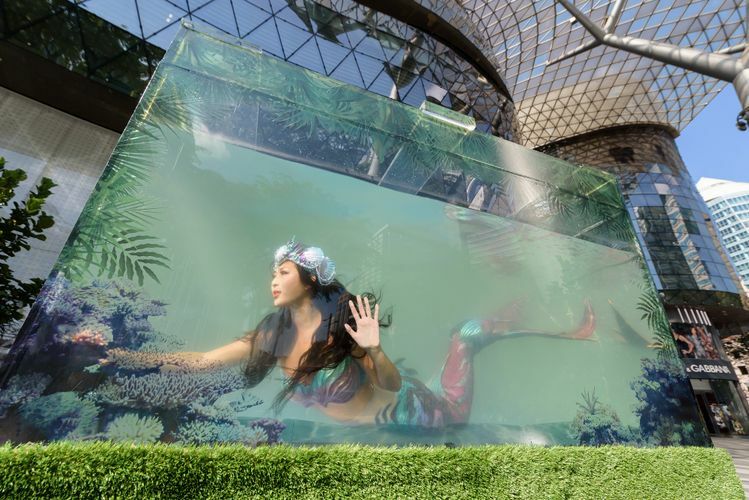 The beautiful mermaid will pose and greet shoppers in Orchard Road’s first purpose-built mermaid aquarium tank measuring 2.4 square meters and 1.8 meters in height and containing some 8,000 liters of seawater. To reward shoppers for sharing these moments, ION Orchard is holding a Facebook contest where five winners will win 125 ION+ Points each for their post, which must include the #10NCelebrates and @IONOrchard tags. The contest ends on 28 April, and shoppers can register for free as ION+ Rewards Members to qualify.